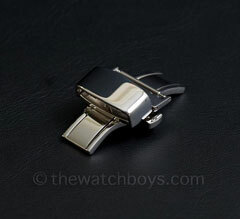 Double Folding, Generic Deployant Buckles (polished steel) [doublefold_polished] - $19.99 : The Watch Boys, Providing quality products for watch collectors! All orders will be shipped at the following rates (new Canada Post rates, as of February 2019). Polished steel, double folding deployant buckles for your strap. This spring bar version is made from solid 316L stainless steel with a polished steel finish.